I find myself consistently zooming out (C-x C--) in every buffer that I am using in order to see more lines of code that I'm working on. Is there a way to set the zoom level in my .emacs, not interactively? Or should I look into setting the fontsize? I've been using the zoom, because it's been the easiest/quickest solution, but I'd rather find a more permanent solution. Are there disadvantages or advantages to using one versus the other? I am unclear on the differences. Yes. What you want is to zoom (the font size for) a frame, regardless of which buffers are displayed there. See library zoom-frm.el, and these descriptions of zooming a frame and zooming a buffer. See, in particular, command zoom-in/out, which does both. It is bound by default to the keys normally bound to just buffer zooming: C-x C-+, C-x C--, C-x C-0, and C-x C-=. You can also bind commands zoom-in and zoom-out to mouse-wheel rotations. Using C-u with any of these commands toggles between frame zooming and buffer zooming. Besides interactively zooming frames or buffers, you can of course set the default font size you want for all frames. The same Emacs-Wiki page has more info about setting fonts and font sizes. "Increase font size by 10 points"
"Decrease font size by 10 points"
Transiently adjust text size in mode line and minibuffer? 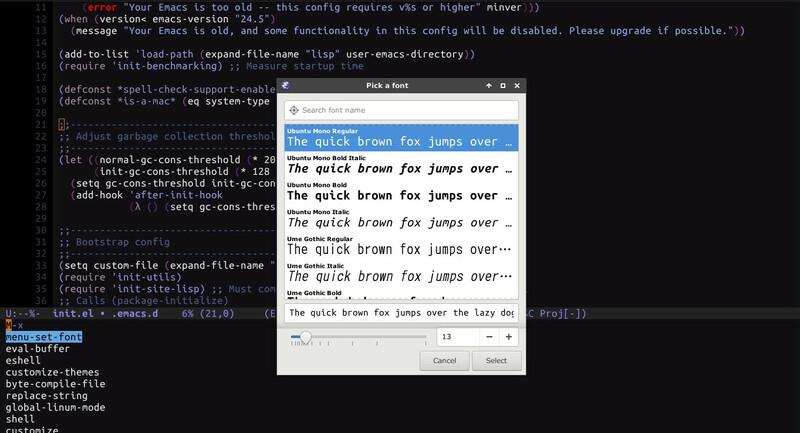 How can I set default font in Emacs? How to set a fractional font size in Emacs? How to make new windows use the current font size? How can I have same font and font-size everywhere?